Dawn of Rebellion, the first Era Sourcebook for the Star Wars™ Roleplaying Game, is available now from your local retailer or on our webstore! Drawing from the characters, locations, and equipment featured in Rogue One: A Star Wars Story and the Star Wars Rebels series, Dawn of Rebellion gives players and Game Masters the tools and the inspiration to create their own adventures set in the early days of the Rebellion against the indomitable war machine of the Empire. 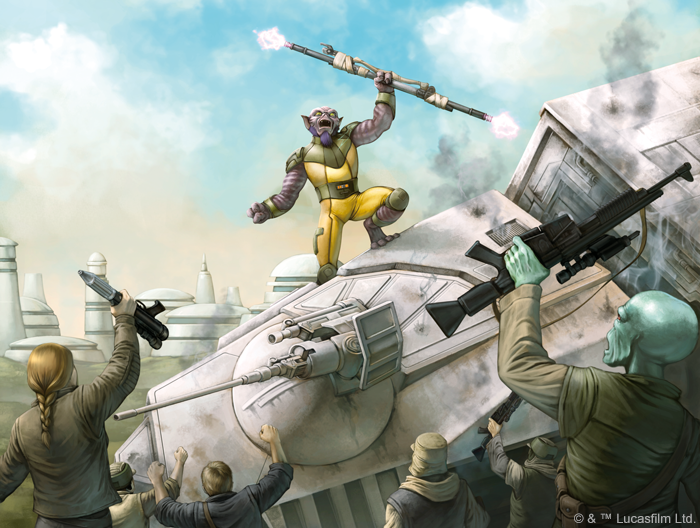 Whether your campaign is primarily themed around Edge of the Empire™, Age of Rebellion™, Force and Destiny™, or a blend of all three, Dawn of Rebellion offers a range of new specialization trees and species for you to use as player characters and the denizens of the galaxy that they meet. Location dossiers for iconic worlds such as Alderaan, Jedha, Dathomir, and more contribute terrific source material for your tales of danger and adventure. Additionally, extensive information on every level of the organization of the Empire gives players and Game Masters a solid background foundation for stories of desperate fringers, brave Rebels, or nascent Force-users. 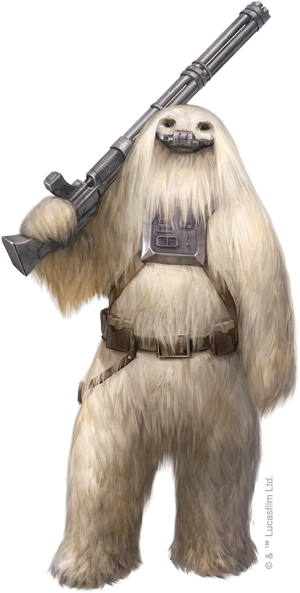 In Dawn of Rebellion, players gain access to an astounding six new specialization trees, representing a wide range of archetypal themes from the Star Wars galaxy that can help contour a character’s place in their own story. We’ve shown you the Retired Clone Trooper, a veteran of countless battles who serves as a stalwart anchor for allies in combat. Force Adherents, while not able to channel to flow of the Force themselves, dedicate their lives to the lost principles of focus, determination, and discipline that guided the Jedi for millennia. Imperial Academy Cadet is a specialization designed for those who became disillusioned with the oppressive government they once swore to serve and now use that same galaxy-class education and training for their own, or loftier, goals. The Padawan Survivor provides a character of any previous specialization with a Force Rating of 1 and includes a multitude of talents for protecting oneself in a hostile galaxy. Pirates navigate the underworld with a sharp tongue and plasteel nerves, always on alert for a good deal or an unsuspecting fool. Finally, Ship Captains roam the galaxy with their loyal crew, confident in the knowledge that that loyalty is earned and rewarded. Four new species also arrive in Dawn of Rebellion, all of which are themed around the control and exploitation of Imperial occupation. Freedom-loving Drabatans are an amphibious race of artists and singers who value expression and independence above nearly all else. Gigorans are burly, furry giants whose family and clan social structure has been upended by organized slavery operations. The ape-like Iakaru never developed space travel on their own, so their simple matriarchal society has only recently been displaced due to Imperial and corporate invasions of their resource-rich homeworld. The mineral-rich planet of Yar Togna has long been a source of materials for vital technologies, and the Empire did not hesitate to dominate the harvest and exportation of resources once belonging to the callous and cybernetically enhanced Tognath people. 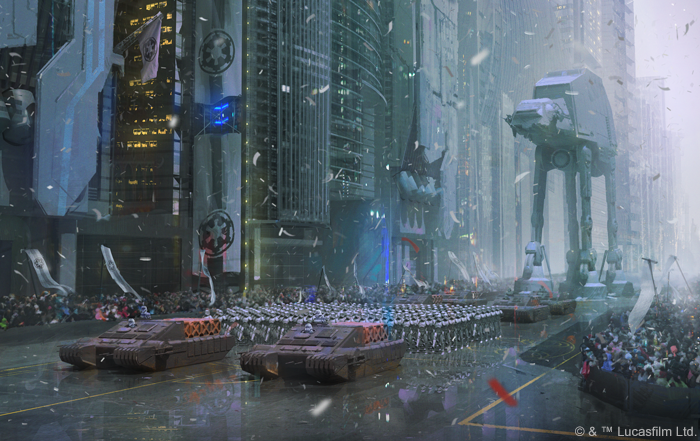 For Game Masters, Dawn of Rebellion offers significant insight into the workings of many Imperial organizations that may vex players, no matter the theme of the campaign. The Imperial Army and Navy are obvious foes, and ones that might largely be avoided by characters not playing an Age of Rebellion story. However, COMPNOR, the Imperial Security Bureau, and the Inquisitorius are fundamentally more insidious and pervasive. Beyond that, other groups like criminal organizations and independent Rebel cells provide both allies and opposition, as all kinds of motivations and goals may align or counter in interesting ways. Modular encounters also make a return in Dawn of Rebellion, showcasing each of the different legendary locations featured in the book. As always, these encounters are designed to give players a strong sense of connection between the locale and the campaign, though any of the encounters could easily be modified to assimilate into an existing story. The embers simmer, ready to become a mighty blaze. From the populous and buzzing Core Worlds to the barren frontier of Outer Rim, no individual can fully escape the repercussions of the Galactic Empire. Even if one never sees a stormtrooper or hasn't felt terror in the shadow of an orbiting Star Destroyer, the presence of the Empire permeates all things. It is a galaxy in which, if the Emperor so wishes, it shall be. Civilization has never seen such darkness. It has never needed such hope. It has never before needed heroes more. Join the fight. 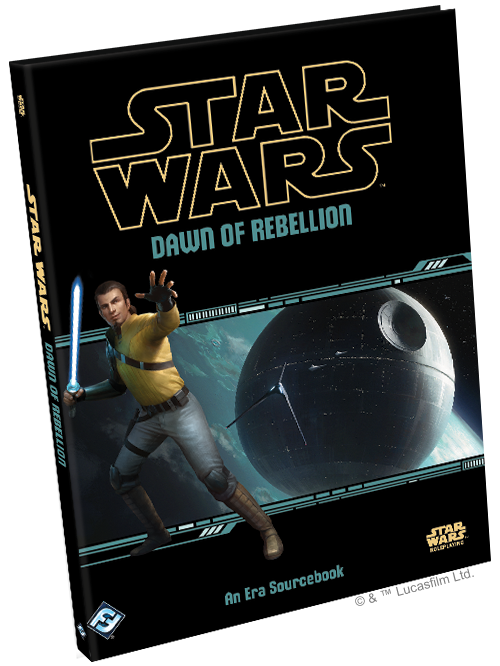 Dawn of Rebellion (SWR10) is available now at your local retailer and our online store, so pick up your copy today!